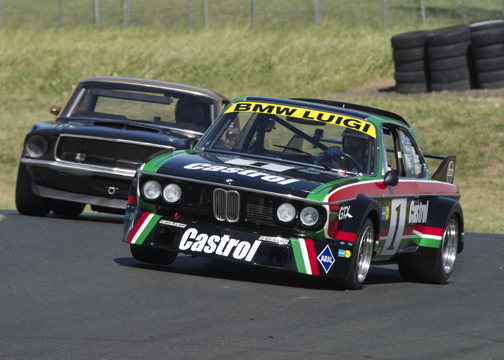 Luigi is back on track at the 2014 Sonoma Historic Motorsports Festival. In just over 90 days since his arrival in America, Luigi is back in action on track. 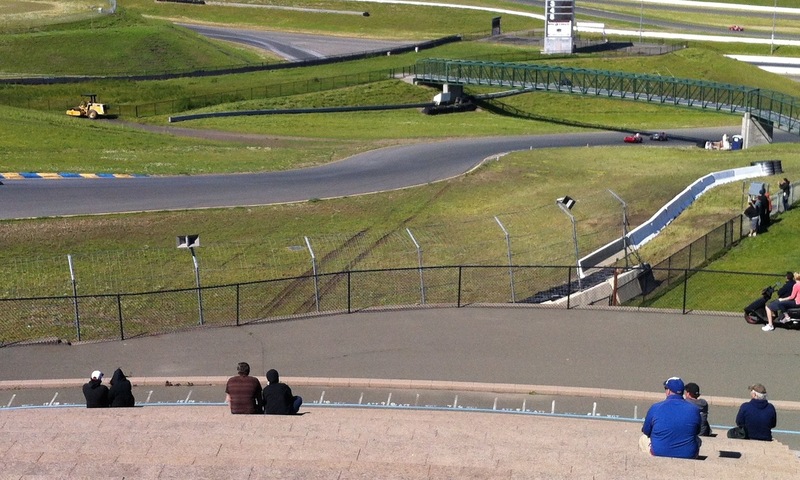 Last weekend we took him to the Sonoma Historic Motorsports Festival at Sears Point Raceway in Sonoma. The weekend was not without drama. On Friday I came into Turn 11 and found I had no front brakes. I ended up spinning the car to the inside of the turn, missing the stacks of tires placed there to keep people from cutting the turn. It turned out that there was a loop in the front brake line that went up over the transmission tunnel, but went way up high on the cowl. This was allowing air to accumulate there, making the front brakes ineffective. Jim re-routed the line, bled the system, and all worked as it should after that. The car is quite a bit different than my other CSL. This car is built from a factory motorsports chassis which is lighter and more flexible than my other car. This car is also fitted with the motorsports suspension and brakes which are much more effective than the street suspension and brakes that was on the other car. We ended up 11th out of 22 cars in my group. I am very happy with this result, especially since many of the cars were much younger than Luigi! I am looking forward to getting to know this car, and learning how to getting the maximum performance out of it. All the credit for the quick turn around for the car goes to Jim Froula up at Racecraft. He planned the project, found the people who could execute the work well but quickly, and effectively managed each step in the process. Jim and the Racecraft crew are hard at work putting the Luigi BMW back together. 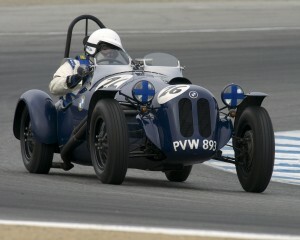 Our target race is the Sonoma Historics in May. 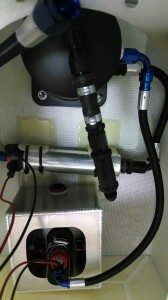 Here is the new fuel cell. 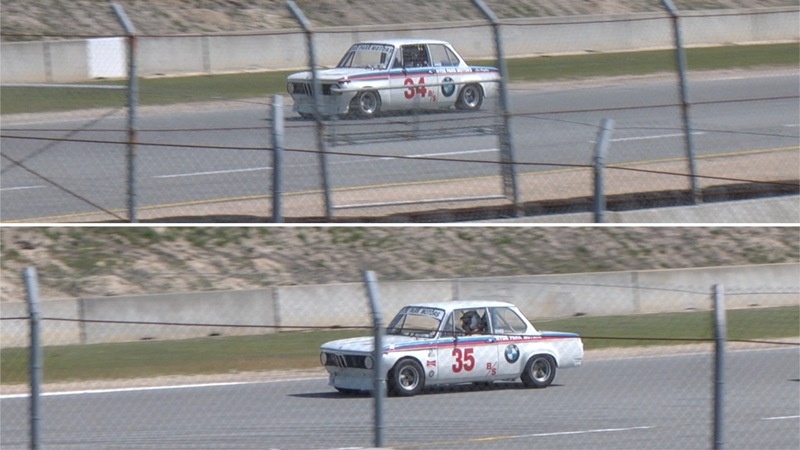 The one that was in the car was a hill climb can, and didn’t have enough capacity for circuit racing, so out it came. We decided to not plumb up to the inlets in the deck lid for now, but that may be changed later. Here’s what’s going on inside the fuel cell. The picture is taken looking down from the top of the can. 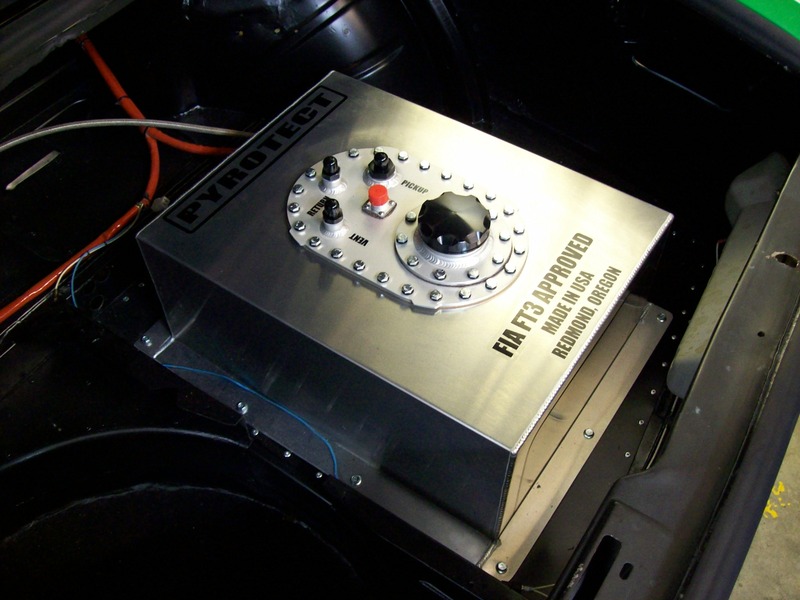 There’s is a catch tank that holds fuel under cornering and braking forces, a low pressure pump moves it from there into the black swirl pot which fills up and has a 10psi relief valve on top to provide a constant column of fuel available for the high pressure pump to draw off of so that air bubble free fuel goes up to the injection pump on the engine. 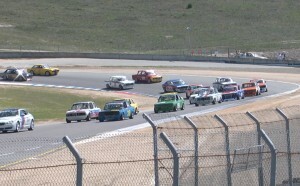 I ran the mighty Willis Wonder and the Koepchen 2002 at the David Love Memorial race at Sonoma with CSRG. The Willis Wonder at speed. Photo courtesy of David Schultz Photography. The Willis ran in Group 1 with about 28 other production and sports racers from the 50’s and 60’s. The Willis had about 2 decades on the next oldest car in the group! 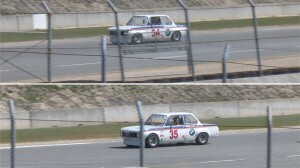 She ran well, and it was the first time I have tried the Dunlop vintage tires. I loved them. The car really settled down, especially the rear end, which had been very squirrely with the Blockley tires. In the Sunday feature race I started 20th out of a field of 28 cars, and finished 13th. I had a race long battle with Marc Hugo in a 1954 Porsche 356A. He was quicker than me through the Carousel and up to turn 7. I was quicker out of the slow corners and down the straights. We traded positions sometimes twice a lap. It was great fun. 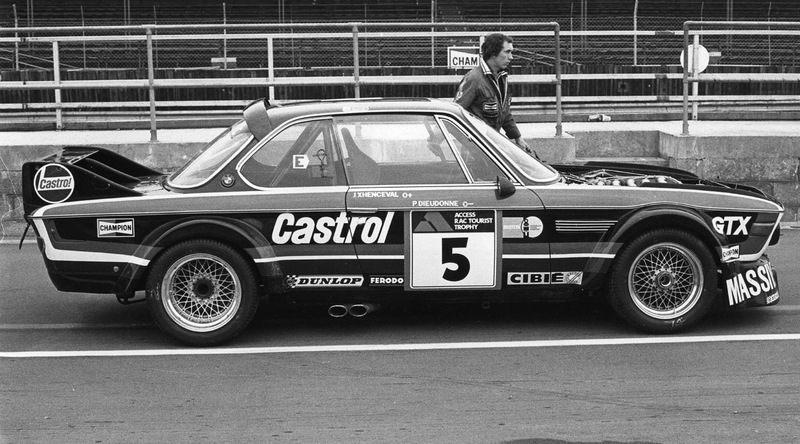 The Koepchen 2002 ran in Group 8, a mixed collection of small and large bore sedans prepared to early 1970’s specifications. The challenge I faced this weekend was back to back races all weekend. I had to jump out of the Willis and into the 2002. The race stewards promised to hold Group 8 long enough for me to get safely buckled into the car. That word did not get down to the pit lane stewards, and I ended up having to start at the back of the group on Saturday afternoon’s race after qualifying 6th. I was frustrated, mad, and began racing like an idiot. Needless to say, that sort of situation cannot end well; and it didn’t. The results from not thinking. Don’t try this at home! Fortunately I was not hurt, and the car can be repaired. The sad part was that I had warnings that I was driving over my head, and I even said to myself that something bad is going to happen if I don’t take a deep breath, slow down, and just enjoy the race. I learned a lot from this mistake, about myself, and about what circumstances can get me to act this way. 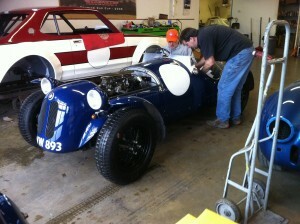 The car is being repaired, and it will be on track again later this summer. We ran our first event of the year last weekend (3/22-23). 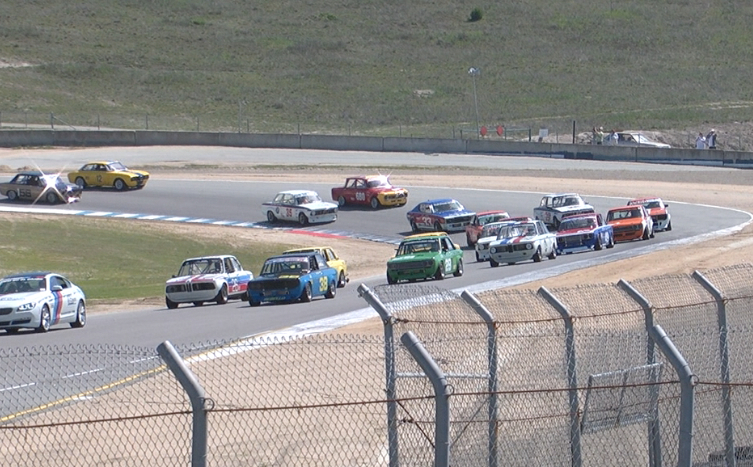 It was the HMSA Spring race at Laguna Seca. Here are the cars we exchanged. The second 2002 is parked further to the right. It was a bittersweet weekend for us. 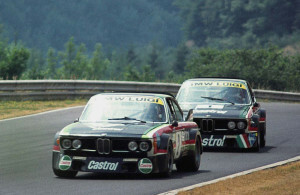 I made the trade with Jeff for the Jagermeister CSL. 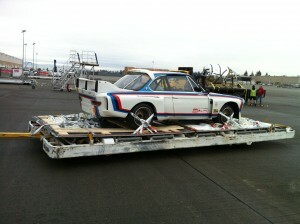 In exchange I got 2 1971 BMW 2002’s with Trans-Am history. The weekend went very well for me. The only problem I had was adapting to the car. The pedals did not fit well at all, and I could not heel-and-toe at all. The pedals lined up in such a way that when I tried to roll my foot over to blip the throttle, my foot got jammed between them. 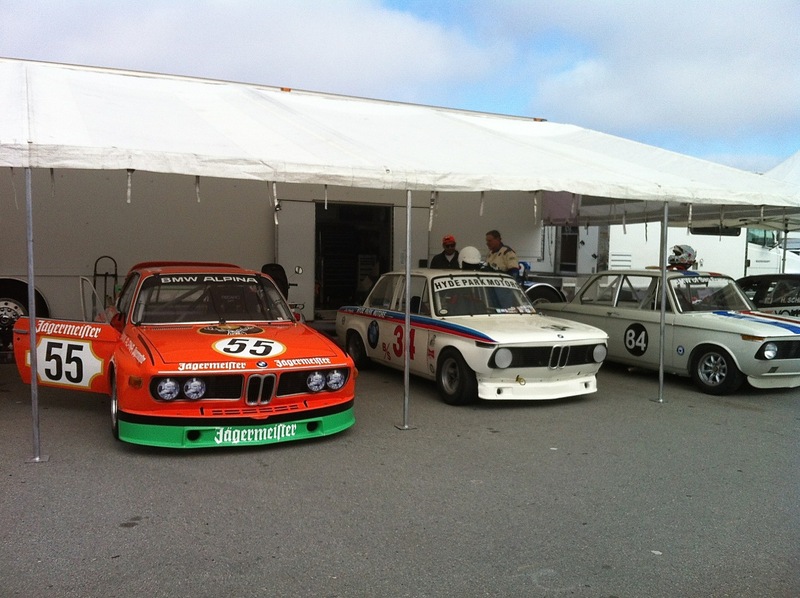 I ran in Group 3, which was made up of 29 of the best and fastest B Sedans on the West Coast. There were a bunch of Datsun’s, BMW’s and Alfa’s. It looked like a Trans-Am 2.5 Challenge grid from the early 1970’s! Here’s the grid from Saturday’s race. Looks like a vintage 2.5 Challenge grid from 1971. I qualified 8th for the Saturday race, and finished 8th. My best lap time was 1:48.8. That meant I started 8th in the Sunday feature race. 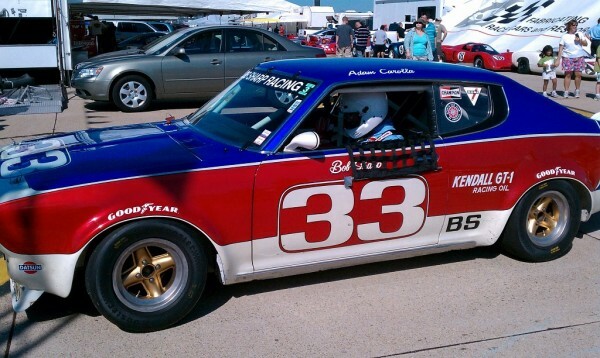 Starting 9th was Adam Carolla in his fast, ex-Bob Sharp Datsun 610. At the start he latched on to my rear bumper, and stayed there for the first 7 laps, giving me all I could handle. He finally retired with an engine problem. Adam Carolla’s fast 610 Datsun. It is an ex-Bob Sharp car. On the first lap I was following Steve Link’s 510 Datsun very closely when he suddenly slowed coming out or the Rainey Curve. It was all I could do to avoid hitting him in the trunk. He said later that he broke a half-shaft. The rest of the race was pretty uneventful, and I ended up finishing 7th. My best lap time of the race was 1:47.6, which was an improvement from Saturday. Terry Forland drove the second 2002 all weekend. That car is not as well developed as the #34 car, and despite his considerable driving skills, he was never quite able to match the #34 car. He ended up finishing 11th on Sunday. That’s me on the top, and Terry Forland driving the twin 2002 on the bottom. I finished 7th, and he finished 11th. It was a great weekend, and a great way too start the 2014 season. 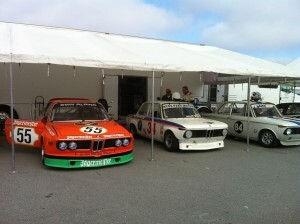 We won’t be back to Laguna Seca until the Rollex Reunion races in August. 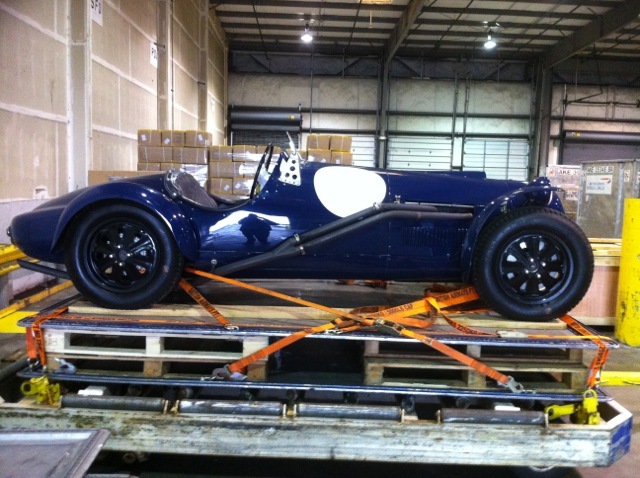 Here is the car sitting in the Customs Warehouse at SeaTac, waiting to be picked up. I became the current custodian of 51203 after I saw it offered at auction through Coys Auction House in January 2013. I have never purchased a car this way before. I have always approached a purchase in the traditional manner, looking carefully, researching, talking with experts, etc., before making any offers. When I saw the car something deep inside me just clicked. I had only 2 days from the time I saw it on the ‘Bring a Trailer’ web site until the day of the auction, so I couldn’t dilly-dally. I did as much Google work on the car as I could in that time, and called a couple of people I thought might know something about the car. The more I learned about it the more intrigued I became. I decided to take the plunge and submit a bid I could live with. I contacted Coys and worked with Nick Wiles, who explained the various ways I could bid on the car. He was extremely helpful. I decided to make a commission bid, which means I sent them the highest price I was willing to pay, and they kept bidding in steps up to that amount. I filled out the paper work, scanned my passport, gave them a CC number as a performance deposit, and then waited until the following Saturday for the auction. The UK is 8 hours ahead of us here on the left coast, so by about 2:00 PM, when I had heard nothing, I figured I had not made the winning bid. I was a little disappointed, but figured it had all worked out for the best after all. The idea that I would bid that amount on a car I had never seen in the flesh sank in, and I was almost relieved that providence had seemingly protected me from some horrible mistake. Needless to say, I was stunned! I guess I never really thought I would win at the figure I offered, but I got it for something less than my top bid. I was ecstatic, and my wife was even more excited about it than I was. Now what do we do? Oh yes, get it home! Coys works with a transport company called Cars UK. They contacted me and began the process of transporting the car to the Northwest. I decided to go ahead and have the car air-shipped, as I was concerned about having it locked in a container for 6 weeks in the salt air. Cars UK was wonderful to work with, and I would highly recommend them. The folks in their Atlanta office were absolutely tenacious when it came to dealing with the folks at US Customs. We are back at Racecraft with the car. It started right up and I drove it up and down the street! There were a few hitches, but just 2 and ½ weeks after the auction my wife and I drove up to SeaTac Airport and collected the car. We then took the car to Racecraft in Woodinville, WA where Terry Forland and Jim Froula operate a restoration, fabrication, and race support business. We unloaded the car in their shop and all stood speechless for fully 5 minutes just looking at the car and soaking in its charm and character. It is truly a special car. My guts had been right. It was worth all the uncertainty. We checked everything over on the car, filled it with race fuel, turned on the ignition, pulled the choke, and pressed the starter button. A few seconds cranking and it rumbled to life! I can barely describe the feeling to be sitting in a car with all this history and having it running happily, and best of all, knowing it was now mine. After letting it warm up, I slipped it into gear and drove out of the shop and south down the Woodinville-Redmond Highway. 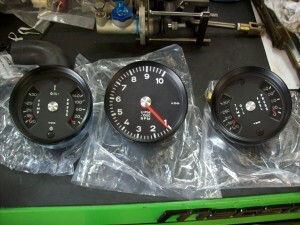 It burbled a little below 2,000 rpm, but once it got to 3,500 it just came alive. Torque, amazing amounts of torque. How that little 6 makes all that torque I can’t understand. It just jumps up to 6,000 in a heart-beat. Of course the fact that it weighs only 820 Kg certainly helps. After a couple of laps up and down the highway I drove it back into the shop and sat there in the car for some time just enjoying the moment and letting it all sink in. Then Terry and Jim got all practical and we began to lay out a game plan for getting the car race prepped for the coming season. The only thing my wife insisted on is that we add back the roll bar that was on the car when it last raced in 2004-2005. So Jim stuck a brain bucket on my head and measured me and the car for a new roll bar. Fortunately we discovered all the openings for the previous bar were still present, and were covered with temporary covers. Spares? What do we need for spares, and where do we find them? Campaigning a car this old presents certain challenges, not the least of which is spare parts to keep it running. We made a list, and Terry volunteered to start searching. Finally, after several more hours of planning and talking my wife and I needed to head back to Oregon. Reluctantly we got back in our car and headed south down I-5. I will be racing the Willis up and down the West Coast at events like Monterey Re-union and the Sonoma Motorsports Festival. When we got home from Seattle late that night the box of historical photos, trophies, letters, invoices, and articles that came with the car was waiting on our doorstep. My wife began to rip into it before I had my coat hung up. Every item that came out of the box was just amazing, and a real tribute to the engineering and creative genius of R. C. Willis. The old pictures were particularly fascinating, as well as a couple of old race programs, and letters from R. C. Willis and Charles Bulmer about the car and its history, along with a collection of 22 cups won by the car back in the day. Many happy hours later we fell into bed emotionally exhausted. To look now at the little car and think about all the history that has passed under its wheels is inspiring and a bit humbling. To try and accomplish what Willis did in this day would be incredibly difficult and expensive. It would be the equivalent of taking a BMW Z3, modifying it, and competing successfully in one of the current feeder pro series. My hat is off to you, Mr. Willis! 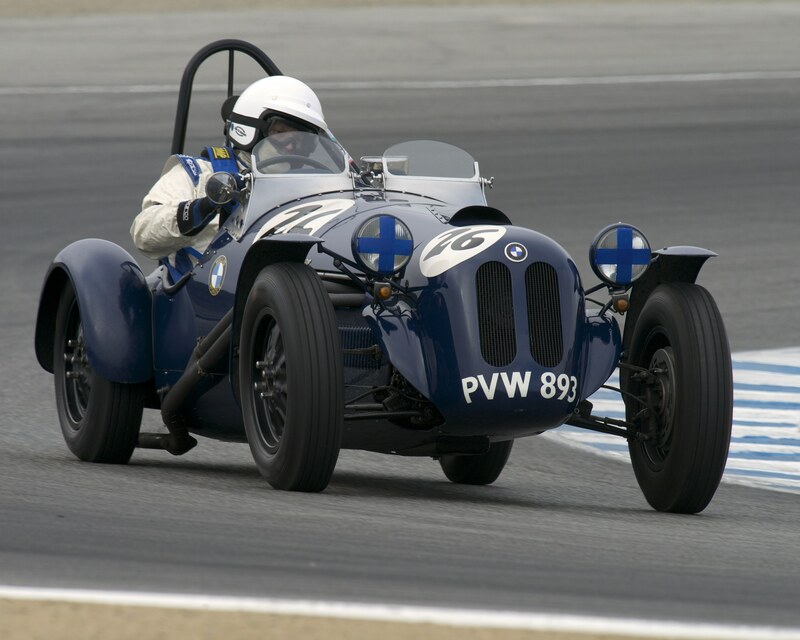 My plan is to continue to add to the storied history of the car by campaigning it in vintage race events and BMW events here on the West Coast. Come on out to a race and cheer this wonderful old car along. Here is the car at the Nurburgring in 1976 during the German round of the European Touring Car Championship. It sat on the pole but had an engine failure during the race. 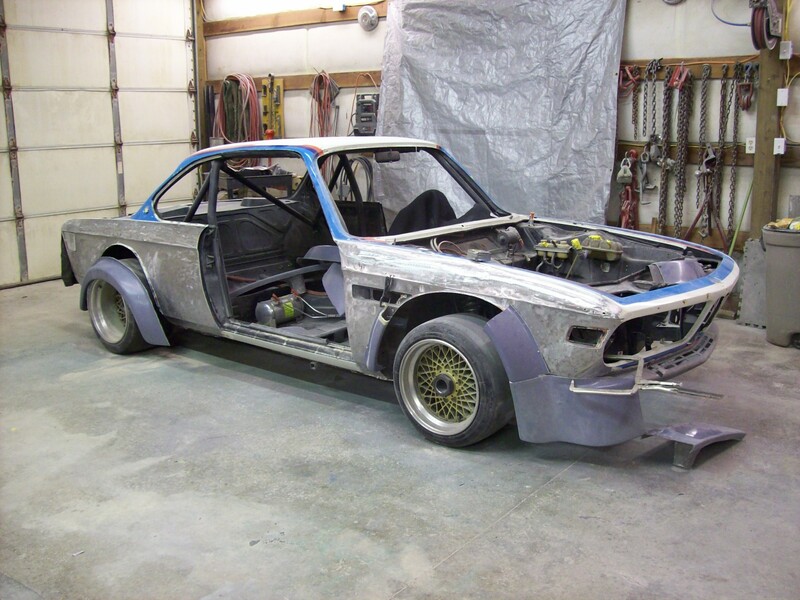 We have begun the restoration/race prep of the Luigi CSL. We have decided to return the car to the same livery it wore in 1976, the year it won the European Touring Car Championship. The first order of business was to remove the wide Group 5 fenders and the front air dam that were installed in the 1980’s. 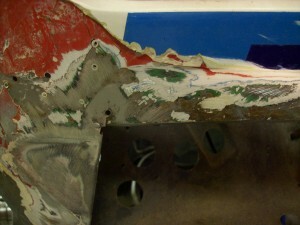 Grinding down through the old paint and bodywork revealed all the old layers of paint from former days. Automotive archeology at its finest. 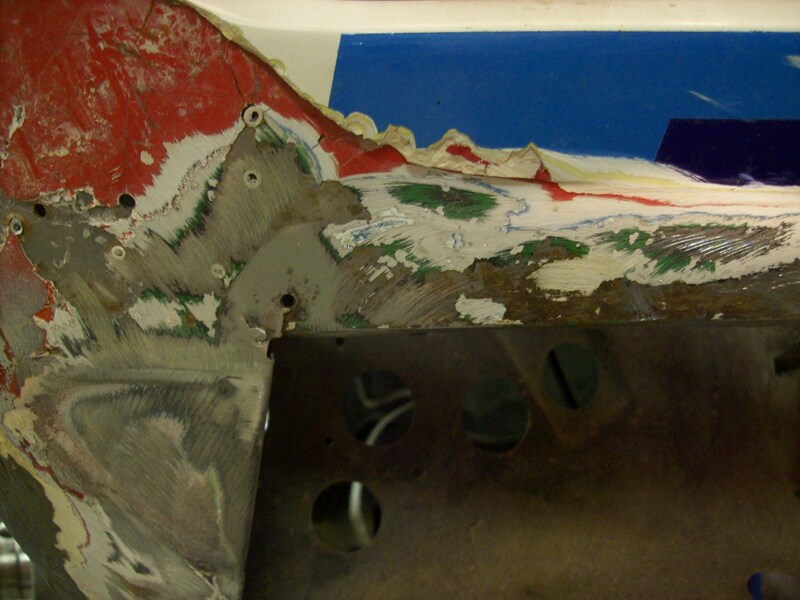 It was interesting to grind down through the old paint and bondo and find all the old layers of paint the car wore through its racing career. Down at the very bottom we found the black/green/red paint from its original Castrol livery. When we removed the front air dam we found that the front valance was in need of some repairs. We want to make the new air dam removable to aid in loading/unloading the car from the trailer and need a solid base to mount it. Here is the finished valance repair. The old valance was cut out, and a new one was grafted in. Once the old fenders were removed and the valance repaired, the engine was taken out and shipped down to Terry Tinney for a freshening. The car was then taken to the painter’s shop. Jim Froula from Racecraft, visited the CSL recently at the painters. 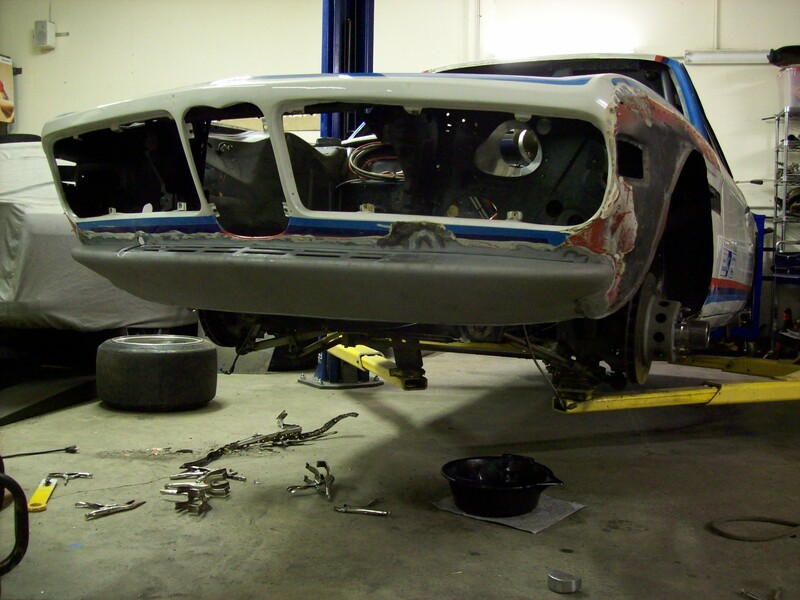 He said that there is not too much progress to report except that they have stripped all the paint and filler from both sides of the car and it’s in amazingly good condition underneath all that mess that was there. No rust and only the slightest indication of contact at each front corner. The fiberglass parts turned out to be a real disappointment. They are nowhere near close to fitting. Trying to fit the disappointing fiberglass parts. The rear flares are about 2″ narrower than the fronts, but the shape is okay so making them a little wider will be easy. The front flares are just wrong in every way. The good news is that the fiberglass guy we have on the job can make anything so I’m confident it will look right in the end it was just a hurdle we didn’t expect. The main reason for Jim’s visit was to get really detailed about how the flares need to look, how much gap to allow around the tires, how far they need to protrude from the fenders, how they need to be attached, etc. Here is the look we will be trying to achieve. 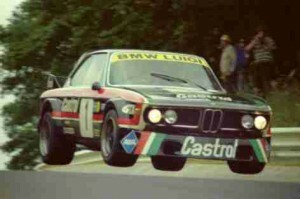 This is the #3 Luigi car from the race at SPA in 1976. They reviewed a whole bunch of photos, made a bunch of notes and measurements and they now have some clear guidance on how to proceed. More importantly they are still confident that our schedule is realistic and promise to meet our date for the Sonoma Motorsports Festival in May. Jim has have allowed a month after painting to reassemble everything and maybe even get it out to a track day before we head south with it. On the engine side of things. The injection pump and injectors are out to the specialist that will thoroughly clean them out and make sure they are flowing properly. Terry Tinney should have the motor disassembled and inspected early next week so we’ll have more information on any issues there might be there. Jerry Orr leading the pack at Lake Phalen. Notice the different driving styles based on drive wheel location. While participating in an auto cross event held at Brainerd International Raceway during the summer of 1970 I met a man named Jerry Orr. 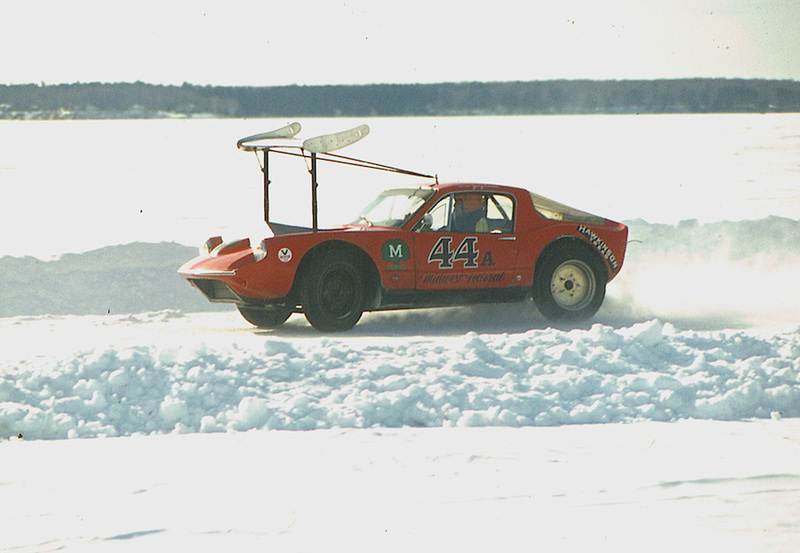 At that time Jerry was the president of the International Ice Racing Assocation. The IIRA held a series of races during the winter in Minnesota, Wisconsin, and southern Ontario. He told me about how much fun it was, and how much I’d learn about car control, race strategy, and car preparation. Mostly he talked about the fun. I decided that I would give it a try with my trusty NSU. The IIRA ran 3 classes broken down by engine location and drive wheel location. The fastest cars were front engine/front wheel drive. There was also a class for front engine/rear wheel drive, and rear engine/rear wheel drive. These were further divided by engine size, making a total of 6 classes. The rules governing tires were very strict. You were allowed to run studs, but only 13 studs per foot of tire circumference. But there were studs, and then there were studs. Needless to say, the studs you used were a critical factor in how fast you went. Regular street studs were not competitive. A tire shop in St. Paul, who were also running a Corvette in the series, had developed a conical stud that worked much better. They had a lot of power to put onto the ice, so they worked hard at developing the studs, and then selling them to the other racers. My arch nemeses, the Archer brothers and their Renaults. The NSU would run in the rear engine/rear wheel drive class, along with an assortment of VW’s, Simcas, and a couple of Renault Dauphins driven by a pair of brothers named Archer out of Duluth. At that time there were fairly large fields, and the races were 2-3 hours long. 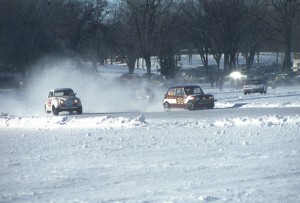 My first event was in Brainerd, and it was cold! How cold was it? Air temp was -25, and wind chill was -35. We left our tow vehicle running all night outside our motel so we would be sure to get to the event on Saturday morning. 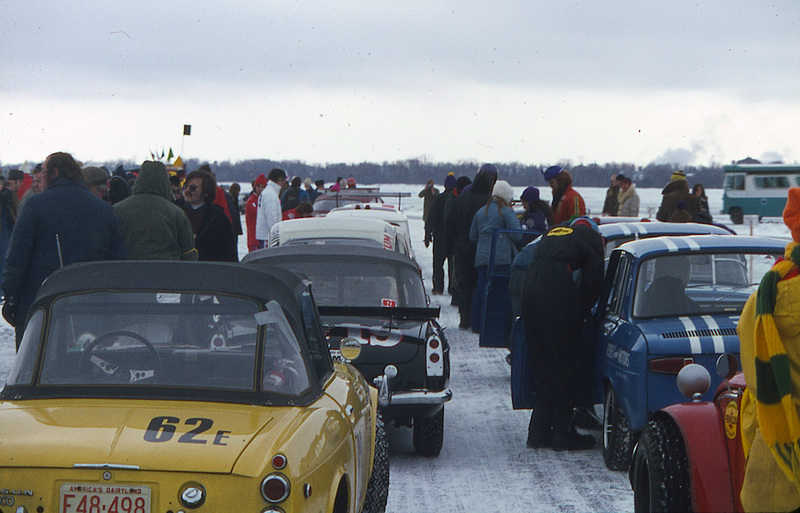 This is the starting grid from the event at Brainerd in 1971. Quite a mix of cars. Notice the studs on the out-turned wheels. The NSU was air cooled, and in the interest of weight savings I had removed what little heating system it had to offer. I regretted it that day! I finished 3rd in my class and won $15 which about covered my gas bill driving to the race. I ran in Duluth (DNF), and the biggest event every year, the Saint Paul Winter Carnival race on Lake Phalen. 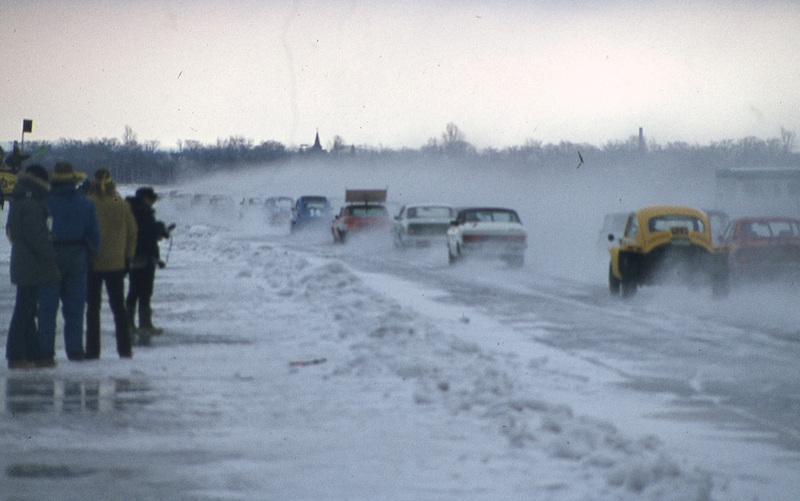 This race always drew big crowds. We had been running the NSU with a single carb, and decided to switch to the dual 38 mm Webers from the autocross engine. Jerry Hanson was very successful in any type of racing he ran. Here he is at Menominee, WI in 1971. Lots of understeer. What a difference that made! 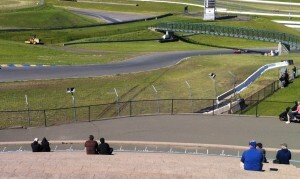 I was able to motor by the Renaults down the straight, and that caused the Archer brothers some apoplexy. Unfortunately these carbs also had a problem with icing up and I ended up DNFing while running second. The start! Just follow the taillights in front of you and hope he stays on track. That spring I sold the NSU, something I still regret. Competing against some of the fastest cars of the day, Willis had a great day. The race was won by Reg Parnell’s Cooper Bristol. Then followed 2 Connaught A-types, and a Ferrari 125/66. Willis finished a credible 5th, and in the process set a two litre lap record of 85.5 MPH. As the 1952 season wound down Willis and Bulmer recognized that there were changes coming in the various Formulae. They also realized that they could no longer compete effectively with a car that was also being driven daily on the open roads. So they began to plan for the 1953 season. These plans developed into a special built and extremely light weight 1500 cc car with a steel space frame designed by Bulmer. Bulmer even designed a special short throw crankshaft that they planned to use in the new car. This ad appeared in the February 1952 edition of Autosport magazine. Unfortunately reality caught up with the team as business set-backs caused Willis to have to sell his garage, and the partially finished race car they were building for 1953. 51203 also had to be sold and was offered in this ad in the Fall of 1952. 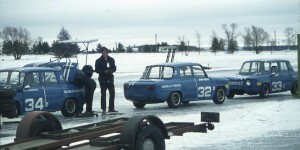 This set-back also proved to be the end of Willis’ racing career. 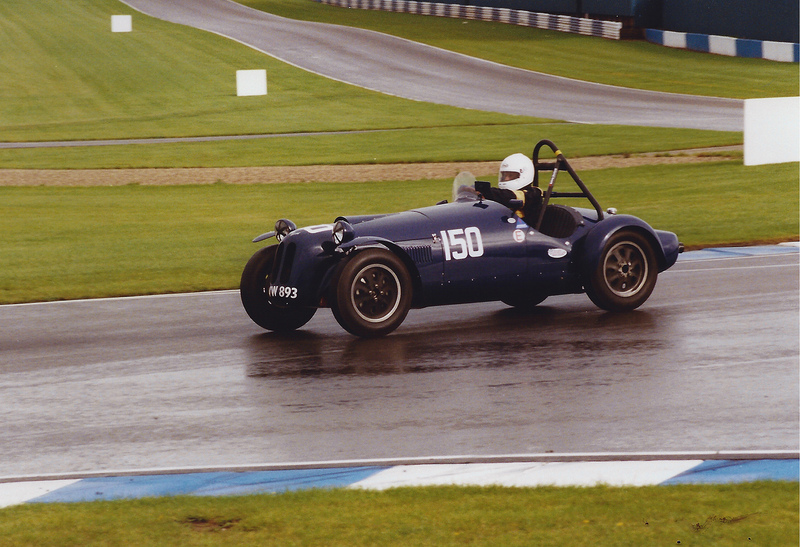 The car was purchased by Berwyn Baxter who raced it throughout the 1953 season. 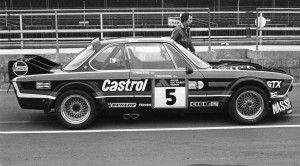 The car appeared on entry lists as the “LMC Bristol,” so named for Willis’ now defunct garage, the Loughton Motor Company. 3rd place finishes at AMOC’s Silverstone race in August, and BARC’s Goodwood race in September comprised the highlights of that season. Baxter bought a C-type Jaguar for the 1954 season so 51203 was idled, and finally it was offered for sale through the Scarth Hill Motor Co Ltd in Ormskirk. Cedric Brierly purchased the car in December 1954 for 365 Pounds. He intended to transplant the engine from the car into his own BS Special. Fortunately his plans changed and he sold the car to Peter Sims of Sheffield before it could be cannabalized. This was how the car looked in 1987 when Bryan May first saw it. The car ran two more races at Silverstone. The first was in July 1955, and finally in October 1956. It is thought to have then been converted back to street car, and it thus disappeared until 1967 when its newest owner, Paul Spencer, wrote to both Bulmer and Willis seeking additional information about the car in preparation for restoration. It was now in several hundred pieces, with its magnesium body long since rotted away and sold for scrap. It then went through a series owners, John Baker (1968-1983), Fuad Mazjub (1984-1989), and Brian May (1989-2001), each of whom had the best intentions of putting the car back together. But it was not until it came to Proby Cautly in 2001 that 51203 was finally and properly restored to its former glory. The car was completely refurbished by Neil Davies Historic Racing in Hertfordshire during 2002-2003. 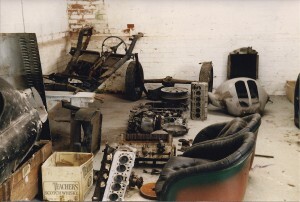 The car still retained its Frazer-Nash Type 40 chassis (#51203) and the 2 litre BMW engine (#361672) with the Bristol head. The biggest challenge was that a new body, faithful to the original had to be fabricated. However, due to safety concerns this one was made out of aluminum. The original cast magnesium wheels were also duplicated by Crosthwaite & Gardner using modern materials and techniques which resulted in much safer wheels. By 2004 the Willis BMW was once again on track winning races. Here Proby Cautly runs the car at a VSCC meet at Silverstone. 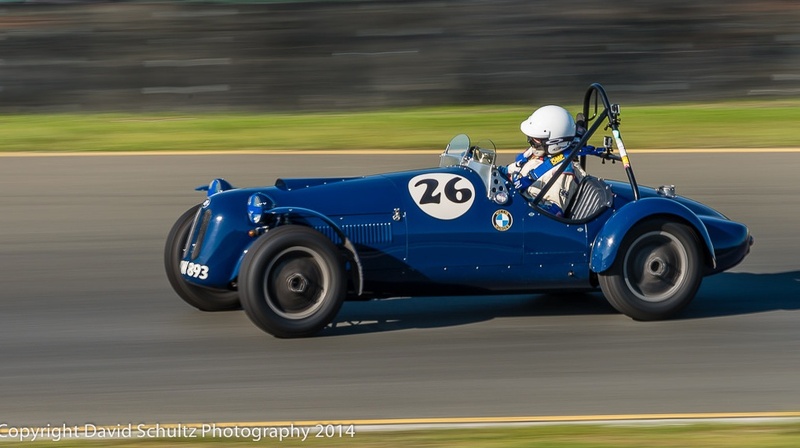 Mr. Cautley ran the car in several vintage events until he sold it back to John Baker who wanted to satisfy his curiosity as to how the car actually performed. From Baker it went to Paul Evans in 2008. Mr. Evans converted it back to street use, removing the roll bar and adding the gauges and lights necessary to obtain an MOT Certificate. Why Am I Selling the Jagermeister Car? Here is Luigi chasis 001 at the Spa 24 Hr. race in 1976. 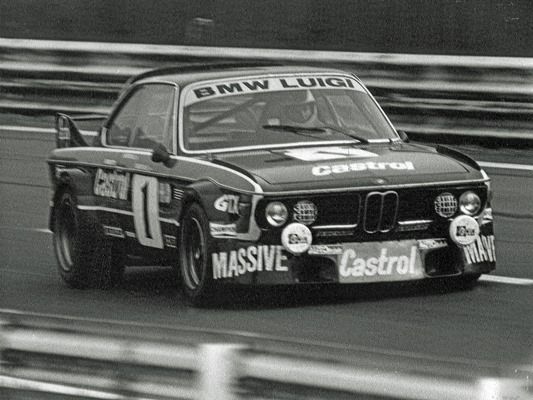 I have been able to purchase the #001 chassis Luigi BMW team car from the 1976-77 European Touring Car Championship series. A series Luigi and his CSLs won in 1976. You will see that it ran 20 races during those years and won 9 times, had 2 second place finishes, a third, and a fourth place finish. A pretty good record. 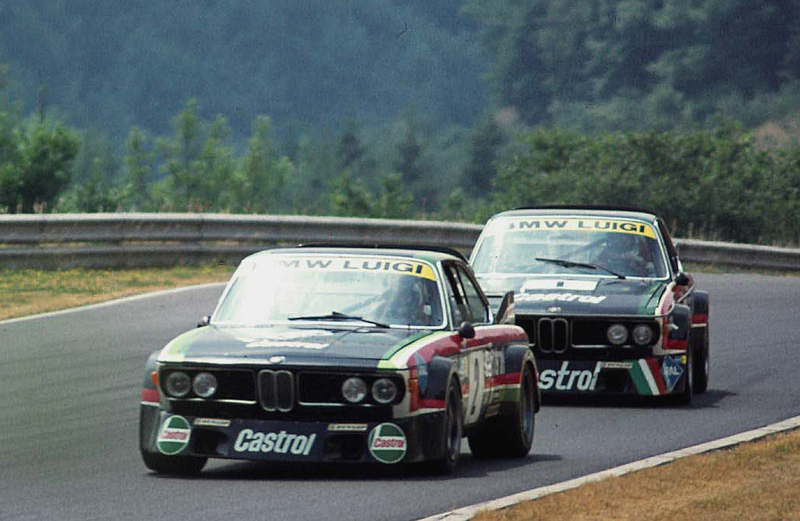 The Team Luigi cars at the Nurburgring in 1976. My car is second in line. Needless to say, I am very excited about securing this car. It is currently painted white with the tricolor Motorsports stripes, and has the wider Group 5 body work. 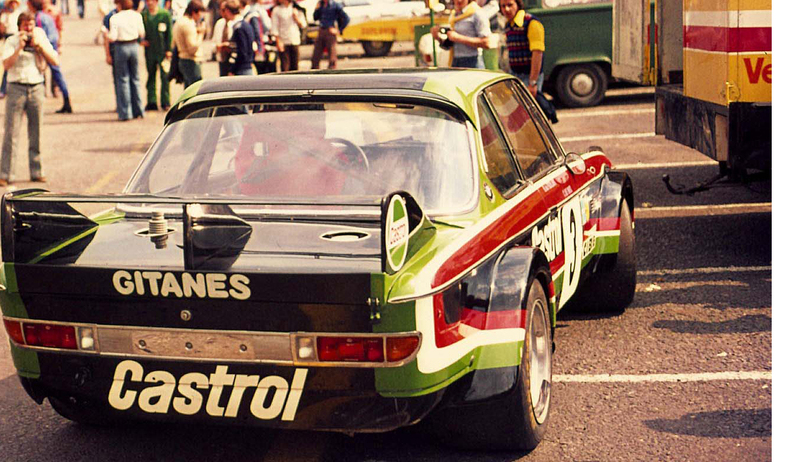 My plan is to repaint it in the black Castrol livery and replace the wide fenders with the proper Group 2 fenders. Luigi chasis 001 at the 1976 Tourist Trophy race at Silverstone. The car arrives in Seattle on January 28th. I will post pictures and a story then. I will also do a story on its history at some future date as well.